The 545i offers powered, automatic incline adjustability. When you train with incline, you know you're giving your legs the best workout possible on a treadmill. Our No.1 goal is to provide a comfortable run and a comfortable walk. 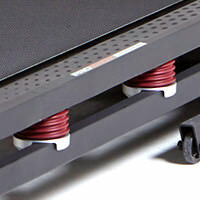 Every treadmill we release is equipped with cushioning throughout the deck. So as you walk, jog, or run, your joints will be thanking you. With less stress on your feet, ankles, knees, and hips, you'll be able to enjoy a longer workout and faster recovery time. It's one reason why people love their treadmills. Track your total calories burned and other workout stats on large, easy-to-read LED displays. You'll stay on top of your workout progress so you reach your goals fast! Track your speed, incline, time, distance, pulse and calories burned. Reduce impact on your joints and burn more calories with incline training. Take the deck up to 10 percent incline with just the touch of a button. Lets you change the incline at the touch of a button. Walk, jog or run your way to incredible results with this heavy-duty treadbelt. The long deck is perfect for long or short strides. Target specific muscle groups with built-in workouts designed by a Certified Personal Trainer. Choose from 20 workouts that target calorie and performance goals. Your speed, time, distance, and resistance. Get smooth, consistent performance every time you work out from this powerful motor. Engineered to maintain its strength for long-term use, this motor is perfect for light or intense workouts. QuickSpeed® allows you to instantly change the speed of the treadmill between 0–18kph with the single touch of a button.